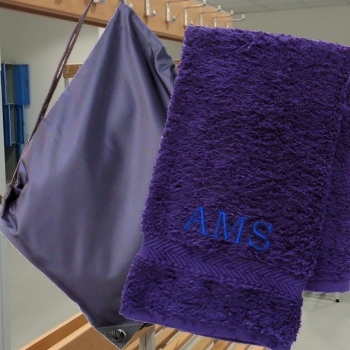 Navy gym hand towel that is 100% cotton and measures 60x40cm. Monogrammed with up to 3 initials embroidered in your choice of thread to coordinate with the navy blue gym bag. Navy drawstring gym bag made from quality water resistant nylon and measures 45 x 34cm ideal for holding sportswear, swimwear and accessories for exercise.